Sanford Biggers uses sculpture, painting, photography, textiles, film, installation and performance to create multi-faceted works that collaborate with the past to help us understand our present. For example, Biggers was interested in the signs and symbols of the quilts purportedly used to help slaves escape north along the Underground Railroad. Biggers has been adapting the quilt form for today, adding his own set of abstract codes that invest new meaning in the form. 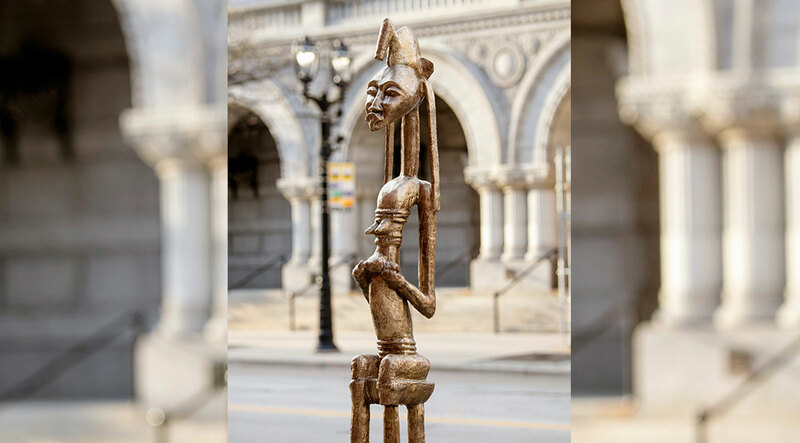 Biggers is also inspired by cultures from around the globe, from Rastafarianism and Zen Buddhism to ancient Egypt and 19th and 20th century African sculpture. In BAM (Seated Warrior), 2017, Biggers casts his life-size Warrior by marking and mutilating a small wooden African “power” figure, then casting it in bronze, expanding its size to both hide and exaggerate the violence done to the original. While the serene pose of Warrior suggests a spiritual response to the violence done to its body, Biggers also evokes the contemporary epidemic of violence against Americans of color. This jarring juxtaposition is at the heart of Bigger’s work. The artist sees himself as a collaborator to the African and African American artists and artisans who came before him, borrowing, enhancing and memorializing their work and struggles through his own object-making. Biggers, born in Los Angeles in 1970, lives and works in New York. He received his MFA at the Art Institute of Chicago in 1999, and his BA at Morehouse College, Atlanta, in 1992. He is currently an Associate Professor and Director of Sculpture at Columbia University. Recent one-person exhibitions have been held at: the Museum of Contemporary Art, Detroit; the Brooklyn Museum of Art and the Sculpture Center, New York; the Contemporary Arts Forum, Santa Barbara; the Contemporary Art Center, Cincinnati; and the Contemporary Art Museum, Houston. His work has been included in group shows at: the Whitney Biennial, Performa, the Metropolitan Museum of Art, the Studio Museum of Harlem, the New Museum and the Children’s Museum of Art, New York; KMAC Museum, Louisville; the Museum of Contemporary Art, Chicago; Prospect 1, New Orleans; and the Tate Modern, London. In 2017 he won the prestigious Rome Prize in Visual Arts from the American Academy in Rome.